One more tidbit from our 2006 Email Usage Survey we thought might interest our readers, especially those folks at Microsoft working on the Windows Vista and Office 2007 teams. This year, 90% of respondents are running Windows XP and 74% are running Outlook in some flavor (54% of the total respondents are on Outlook 2003). 38% said they plan to use Windows Vista and 42% said they plan to use Outlook 2007 within the next year. It will be interesting to see how responses change in next year’s survey as we all adapt to these new tools. Posted by brad at 9:28 am on July 27th, 2006. We also asked a series of questions proposed by Microsoft Research for assessing our respondent’s feelings of email overload. Our CEO and founder, Deva Hazarika, has posted his analysis of these results on his new weblog, Email Dashboard. We have posted the raw results of all of our questions here on our site. The graphs contain some additional data not referenced in our previous posts (41% of you report checking email “Constantly.” Yikes!) A permanent home for the 2006 survey results and analysis can be found here. See the bottom of last year’s post for additional information on coping with email. 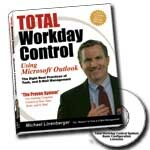 Michael Linenberger has posted detailed step by step instructions on getting started using ClearContext with the Total Workday Control System. This is a great place to start if you are using the TWC-enabled version of ClearContext. We have added two more TWC custom email views to the product – TWC Inbox by Category and TWC Inbox by Topic. Go to our TWC partner page for more detail. Posted by brad at 9:38 am on July 21st, 2006. This is continuation of our analysis of the 2006 ClearContext Email Usage Survey Results. As email continues to increase in importance and take up more of our time, it’s no surprise that many of us are looking to additional tools for help to increase our productivity. It’s clear from our 2006 Email Usage Survey that users are becoming constantly connected to email – turning to webmail and mobile access in greater numbers. Both Yahoo and Google almost doubled in the number of users – though at the time of our 2005 survey, Gmail was a relatively new product. Another sign that email is taking a more important role in our lives – the number of respondents reporting that they use a mobile device to access email increasing from under 30% to over 40%. It’s interesting to note that the types of mobile devices used to access email are fairly evenly spread out across various platforms, with Blackberry taking the lead. Besides email access and clients, we wanted to get a better idea of what tools are being utilized alongside email to help productivity. 60% of respondents said they use an anti-spam product. Much like last year, there is no clear winner in the anti-spam wars. Though we gave 14 choices of anti-spam products in the survey, more than 50% of respondents selected “Other” and specified yet another anti-spam solution. For what it’s worth, Norton and McAfee’s products had the biggest share of users, at 19% and 12% respectively. 59% of users said they were using a search product with email. Google is the clear winner for the second time in our survey, capturing 47% of the email search market – presumably via a combination of Google Desktop Search and use of the native search function in GMail. LookOut, Yahoo!, MSN, and Copernic individually captured between 10 and 15% of the market. Finally, almost a third of respondents said they use other tools to help manage their email. Popular Outlook add-ins include Plaxo, ClearContext, Getting Things Done, LinkedIn, Anagram, and ActiveWords. We’ll wrap things up on Monday with a summary and a handful of other tidbits from the survey. On the Bright Side, We’re Getting Less Spam! As mentioned in our last post, 250 people completed responses to our email survey. The bulk of these respondents were sourced through our weblog and sponsors. For the most part, respondents should be considered Windows and Outlook-centric email power users. 61% of us receive over 50 emails/day (about the same as last year), with approximately 9% receiving 250 emails/day or more (down from almost 15% in 2005). So, the numbers at the higher end of the scale are actually decreasing. Surprisingly, though email volumes are not increasing from last year, the amount of time spent working in email is. Last year 14% of respondents said they spent four hours or more working in email, this year 22% of us are spending that. "I try to be mindful that when I send someone an email, i’m usually creating work or demanding their time. I try to be judicious." However, it seems like most people are increasingly using email in ways that demands additional time from others. It’s good that technologies like anti-spam tools appear to be helping in keeping people’s email under control. However, that annoying yet easy to process (delete) email appears to be replaced by more and more messages that generate real work – causing email overload to be an even bigger problem than before for many users. As we’ve mentioned before, email is becoming a task and workflow system for many people; more like a lightweight project management tool than a simple way to communicate. As this becomes the case for more and more people, it will be critical for users and vendors to fundamentally change the way they think about email and how to make it really work. A final note on volume – despite the proliferation of productivity methodologies that emphasize Inbox clearing, people are leaving more email in their Inbox than before. 51% last year said they kept 50 or less messages in the Inbox. That’s down to 39% this year. Meanwhile, the number keeping 1000 – 3000 messages almost doubled: 5.7% to 10%! This appears to be based on two factors – the previously mentioned increase in email importance and the increased use of webmail clients like Gmail with large storage capacity and an emphasis on tagging and searching email. We’ll talk more about the latter in our next post. 250 responses from a variety of sources, including readers of The Office Letter, Office Evolution, The Unofficial Microsoft Weblog, Yahoo! developed by Microsoft research to measure user’s feelings of email overload. mobile device (up from 29% last year). more per day in email, up from 14% last year. or more messages in the Inbox almost doubled to 10%. Gabor Cselle has posted an overview of several different approaches researchers have taken to re-designing email, breaking it down into three categories: task driven email, smart email organization structures, and cool features. It’s always interesting to see how other folks are trying to re-envision the way email works. so it doesn’t detail the thought process behind some of our newer features, but you get the idea. Posted by brad at 12:02 am on July 10th, 2006.